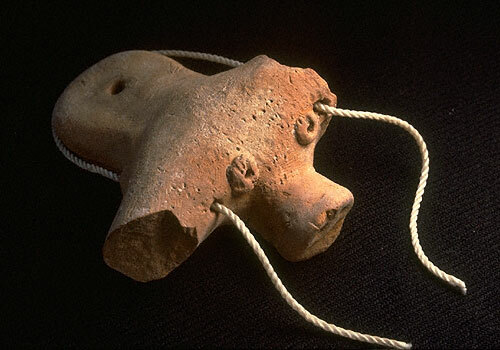 Terra cotta figurine of a bull from Harappa without a hump. There may have been many species of bulls used in different parts of the Indus valley. 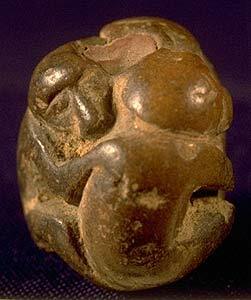 This figurine is from Early Harappan levels at Harappa. 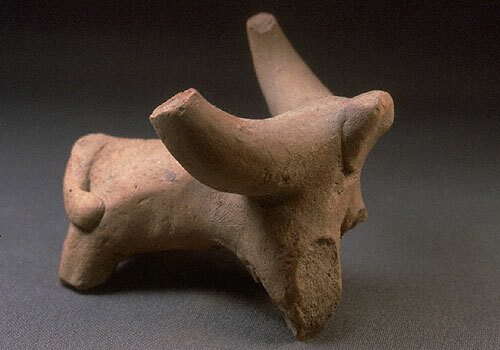 The legs on are joined together, and along with the highly stylized hump, delicate horns and tail, are characteristic stylistic features of the Early Harappan bull figurines. 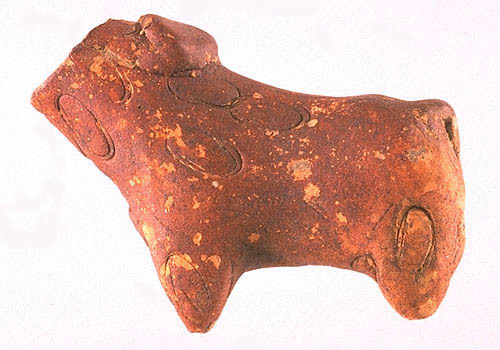 The earliest animal figurines from Harappa are Early Harappan (Ravi Phase, Period 1 and Kot Diji Phase, Period 2) zebu figurines. They are typically very small with joined legs and stylized humps. A few of these zebu figurines have holes through the humps that may have allowed them to be worn as amulets on a cord or a string. One Early Harappan zebu figurine was found with the remains of a copper alloy ring still in this hole. 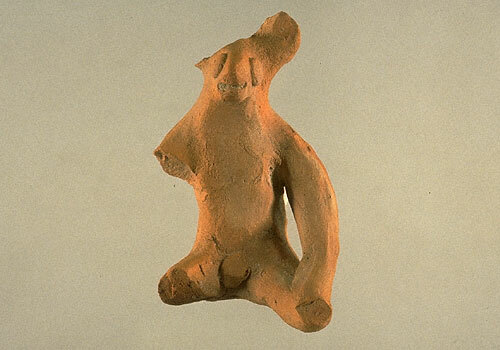 Approximate dimensions (W x H(L) x D) of the uppermost figurine: 1.2 x 3.3 x 2.8 cm. 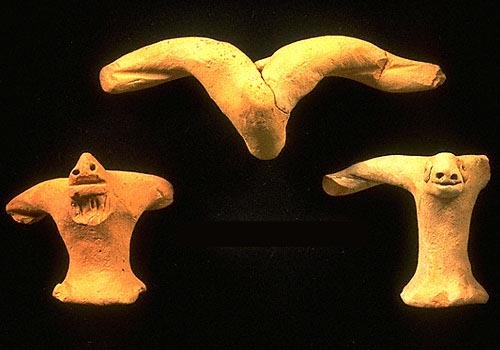 A small subset of the figurines from Harappa originally had wheels. Of the many small terracotta wheels found at Harappa, at least some must have been intended for these wheeled objects. 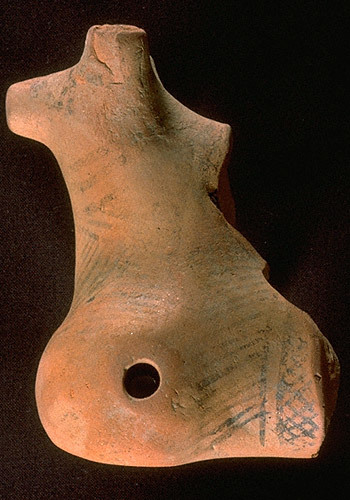 One style of wheeled figurine has lateral holes for the axles through the bottom of the torso. Approximate dimensions (W x H(L) x D) 5.9 x 6.2 x 8.7 cm. 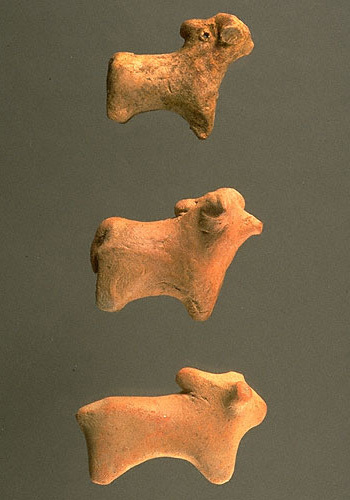 Some of the Early Harappan zebu figurines were decorated. One example has incised oval spots. It is also stained a deep red, an extreme example of the types of stains often found on figurines that are usually found in trash and waste deposits. Approximate dimensions (W x H(L) x D) 1.8 x 4.6 x 3.5 cm. Other animal and sometimes anthropomorphic figurines are decorated with black stripes and other patterns, and features such as eyes are also sometimes rendered in pigment. 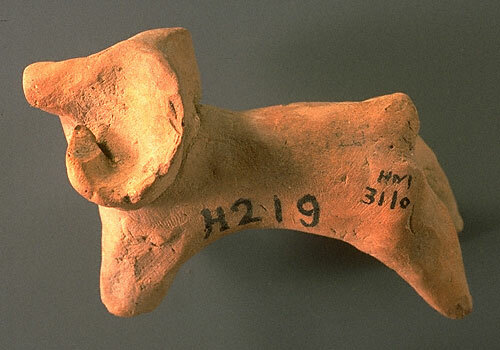 Figurines of cattle with and without humps are found at Indus sites, possibly indicating that multiple breeds of cattle were in use. Approximate dimensions (W x H(L) x D) 3.9 x 8.5 x 5.5 cm. Water buffalo are often similar to figurines of humpless cattle, except that the water buffalo figurines usually have large (and sometimes incised) backswept horns. Approximate dimensions (W x H(L) x D) 6.0 x 8.0 x 6.0 cm. Some quadruped figurines are difficult to classify because the general form and many of the attributes of humpless cattle, water buffalo, and even rams may be very similar. Any of the three may have incising on the face and/or horns. Sometimes the shape of the horns and the posture provide the only clues to differentiating them. Some water buffalo figurines have featureless upturned faces and large backswept horns with no incised lines and the ends of the horns may project slightly upward. (Thus the ends of the horns might, in fact, project slightly forward if the head was facing forward, complicating the problem of identification.) However, the raised head is a typical posture for an alarmed water buffalo. Other examples of water buffaloes with raised heads can be found on some of the seals and tablets. Approximate dimensions (W x H(L) x D) 6.0 x 7.3 x 6.4 cm. Ram figurines are identified by their large curled horns. Some have incised horns and/or muzzles like the water buffalo figurines and are only distinguished by the curvature of the horns. Approximate height (length): 6.0 cm. The ram figurines are also sometimes decorated with black stripes and patterns. Some may be painted black. Occasionally, incised "wool" is depicted on the bodies of sheep figurines. Approximate dimensions (W x H(L) x D): 3.3 x 6.6 x 6.3 cm. 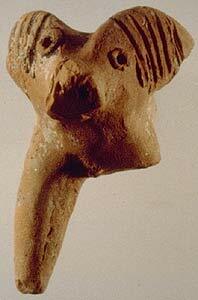 Terra cotta ram figurine from Harappa. 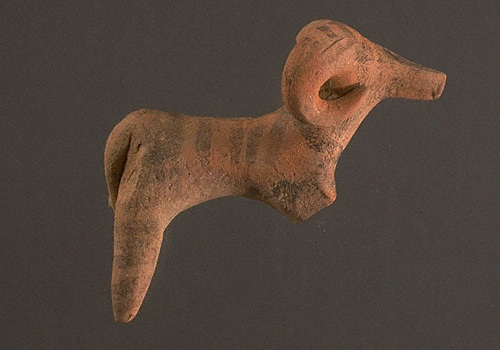 Such figurines may represent sacrificial animals used in specific annual rituals. Figurine of begging dog with upraised front paws and wearing an elaborate collar that is decorated with applied discs that may represent beads or gems.The back legs have been shaped into a stand. Hand formed with applique ornaments and eyes. Some texts from ancient Mesopotamia mention imports received from the land of "Meluhha", widely considered a reference to the Indus Civilization. Among these imports, according to some interpretations, is a colored dog. 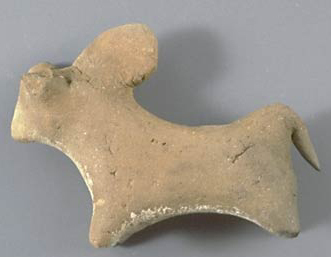 A number of dog figurines have been found at Harappa and at other Indus sites. 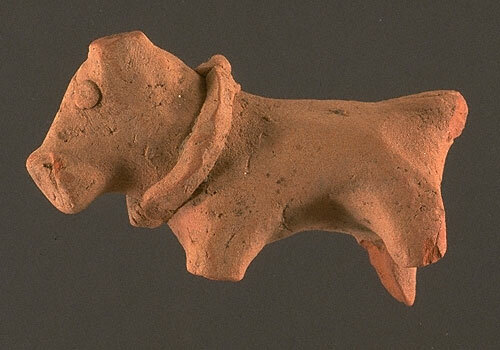 The collars found on dog figurines probably signify domestication, unlike the collars on the rhinoceros or the large feline figurines. Approximate dimensions (W x H(L) x D) 1.9 x 5.3 x 3.3 cm. Approximate dimensions (W x H(L) x D) 1.9 x 3.3 x 2.1 cm. 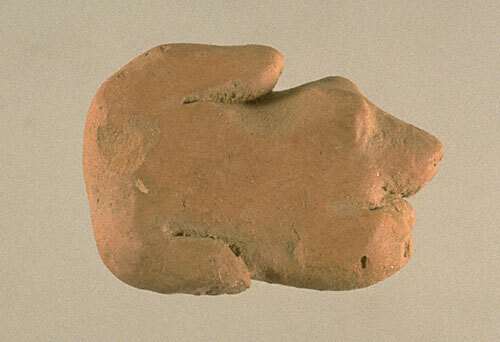 This figurine may represent a tame elephant or an elephant that is being marked for sacrifice. Hand formed and incised. 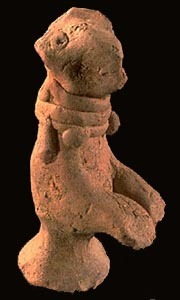 Many of the feline figurines are depicted with collars around their necks (as with the rhinoceros). 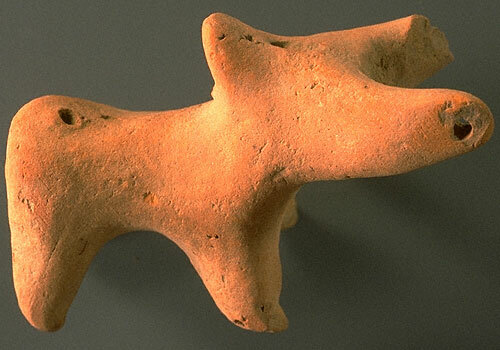 Rather than indicating that these large cats were tame, this symbol of domestication may have been used in rituals of sympathetic magic to obtain a symbolic conquest of and protection from powerful wild animals such as the large cats and the rhinoceros. Approximate dimensions (W x H(L) x D) 4.6 x 11.5 x 6.2 cm. Other feline figurines with large round ears and beards may represent tigers or lions. They are often depicted either standing or lying down with their legs extended to one side. Approximate dimensions (W x H(L) x D) of the larger figurine: 3.3 x 8.2 x 4.7 cm. 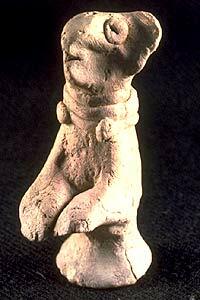 It has been suggested that some feline figurines have anthropomorphic facial features. 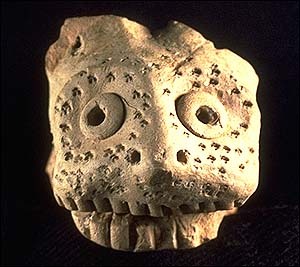 While features such as "coffee bean" eyes are unusual, the facial features of many animal figurines are stylized. Such features as beards are not necessarily anthropomorphic features, but may represent either tigers’ ruffs or lions’ manes. Variations in facial features may represent differences in wild felines rather than anthropomorphization. Approximate dimensions (W x H(L) x D) 4.1 x 12.2 x 6.1 cm. Tiger or leopard figurine with incised facial features, including punctated dots on the face that could be whisker marks. 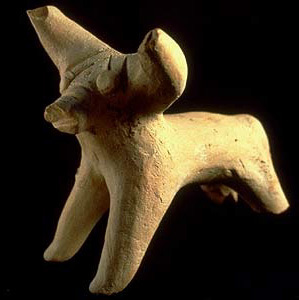 This figurine depicts a normal feline without horns or human face and therefore probably represents the actual wild animal. Hand formed with applique eyes. Other depictions of wild animals include deer figurines with pronged antlers. 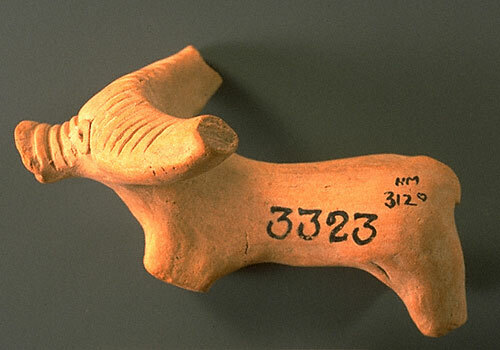 Deer bones found at Harappa may indicate that deer were hunted. Larger wild animals such as the rhinoceros with its distinctive "horned" snout are also represented. Although the rhinoceros is no longer found in many areas of the Indus region, rhinoceros bones have been found at Harappa. 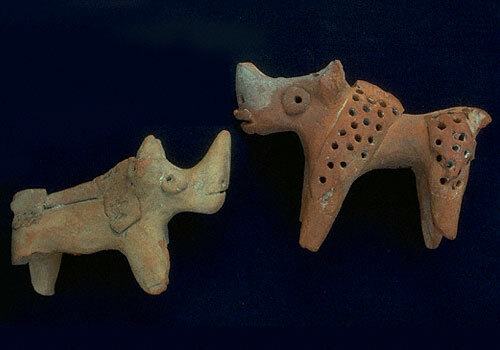 Some rhinoceros figurines have applied lips, and some have an applied strip of clay down the center of the back beneath the applied decorated "hide" that is characteristic of rhinoceros figurines. Approximate dimensions (W x H(L) x D) of the larger figurine: 3.1 x 6.0 x 8.5 cm. Although it was surely a wild animal, some of the rhinoceros figurines wear collars. 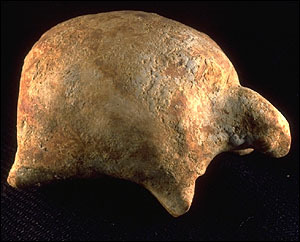 While a collar might indicate domestication, it is unlikely that this is the case with the rhinoceros, although they may have been held as captives. Approximate dimensions (W x H(L) x D) 3.3 x 8.7 x 4.5 cm. Several turtle figurines have been found at Harappa, some with few defined features and others with clearly delineated shells and other features. The gharial is also represented among the figurines, and is depicted in the iconography of several tablets as well. Monkeys are also still found in South Asia, both in the wild and as pets. A few of the Indus figurines represent uniquely primate postures, such as a monkey sitting with its long arms and hands held on either side of its head. Approximate dimensions (W x H(L) x D) 2.6 x 3.6 x 2.9 cm. In addition to domestic animals, wild animals such as the markhor (wild goat) are represented in the corpus of Indus figurines. The markhor figurines’ distinctive long spiral horns were formed by wrapping the clay around a stick or rod while it was wet. 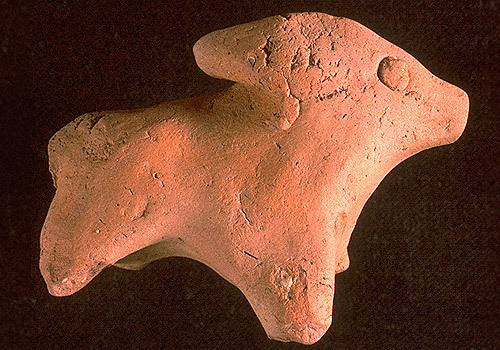 Some markhor figurines from Harappa have holes at the bases of finished necks, probably for joining them to a separate body. 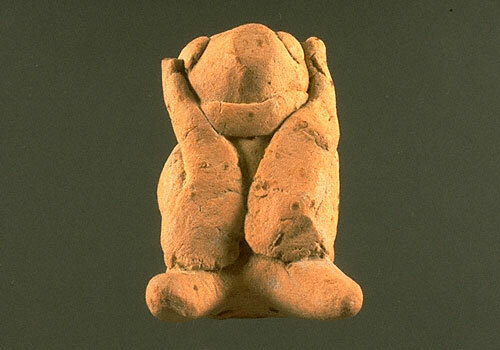 Approximate dimensions (W x H(L) x D) of the uppermost figurine: 10.9 x 2.9 x 2.9 cm. Three terra cotta objects that combine human and animal features. These objects may have been used to tell stories in puppet shows or in ritual performances. 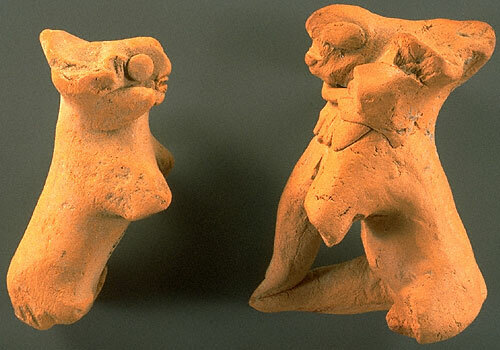 On the left is a seated animal figurine with female head. 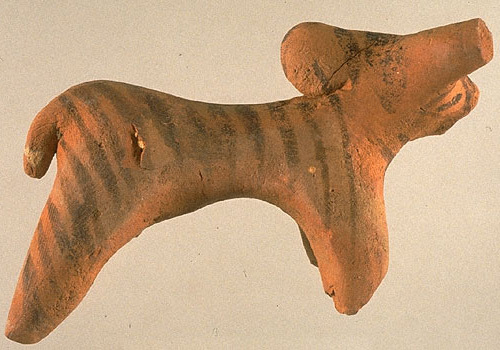 The manner of sitting suggests that this may be a feline, and a hole in the base indicates that it would have been raised on a stick as a standard or puppet. 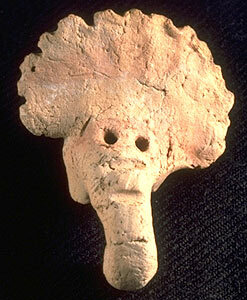 The head is identical to those seen on female figurines with a fan shaped headdress and two cup shaped side pieces. The choker with pendant beads is also common on female figurines. In the center is miniature mask of horned deity with human face and bared teeth of a tiger. A large mustache or divided upper lip frames the canines, and a flaring beard adds to the effect of rage. The eyes are defined as raised lumps that may have originally been painted. Short feline ears contrast with two short horns similar to a bull rather than the curving water buffalo horns. Two holes on either side allow the mask to be attached to a puppet or worn as an amulet. 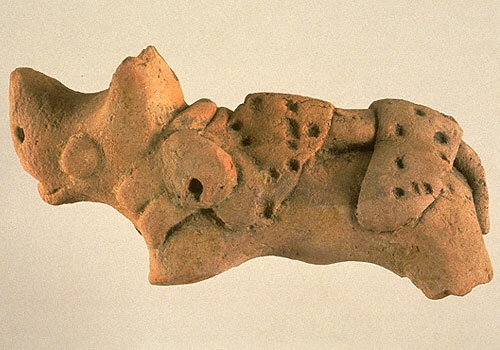 On the right is feline figurine with male human face. The ears, eyes and mouth are filled with black pigment and traces of black are visible on the flaring beard that is now broken. 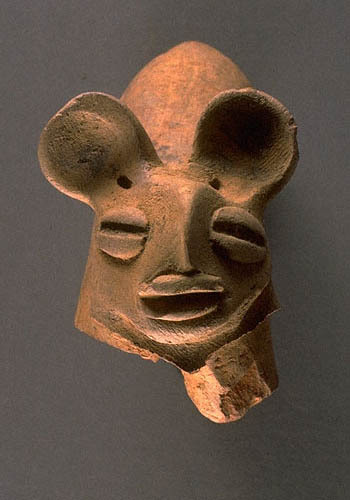 The accentuated almond shaped eyes and wide mouth are characteristic of the bearded horned deity figurines found at Harappa and Mohenjo-daro. This figurine was found in a sump pit filled with discarded goblets, animal and female figurines and garbage. 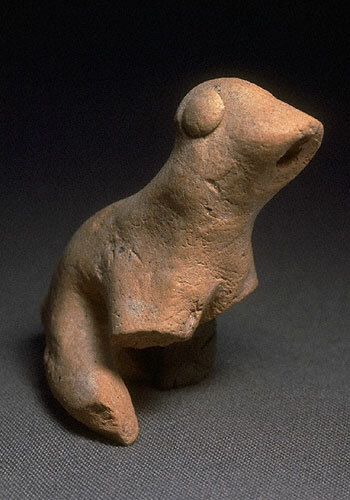 It dates to the final phase of the Harappan occupation, around 2000 B. C.
The Asiatic bear with its large round ears and elongated snout sometimes sits with its front paws on its rear legs, the same posture that is depicted in some figurines. It might have been captured by the people of the Indus Civilization, just as bears have been kept for sport and show in recent times in South Asia. Approximate dimensions (W x H(L) x D) 3.9 x 7.9 x 4.4 cm. Some animal figurines with long ears, especially those with the ears laid back against round hollow bodies, have been identified as hares. 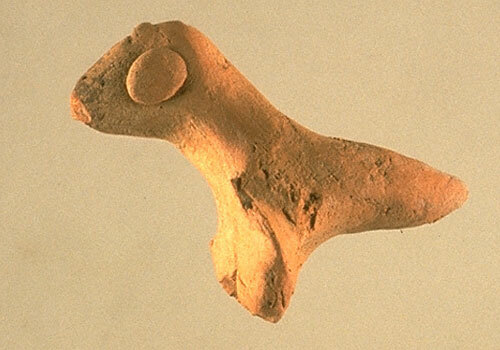 One animal figurine with long ears laid back above a small solid body may also represent a hare. 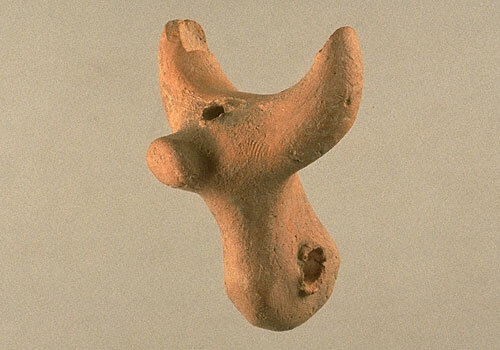 Figurines with shorter ears and round bodies probably represent hedgehogs instead. 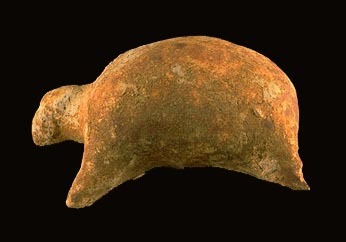 One unusual and well-made figurine from Harappa is clearly a pangolin, the scales of which are represented by flattened discs from its head to its long graduated tail. Approximate dimensions (W x H(L) x D) 2.1 x 4.9 x 3.6 cm. Another aquatic creature represented in the figurine corpus of Harappa is the fish, which has applied fins, incised gills, and a vertical hole through the center of its body. Like the gharial, the fish is also a common motif on tablets as well as in the Indus script. Approximate dimensions (W x H(L) x D) 1.5 x 6.4 x 1.6 cm. 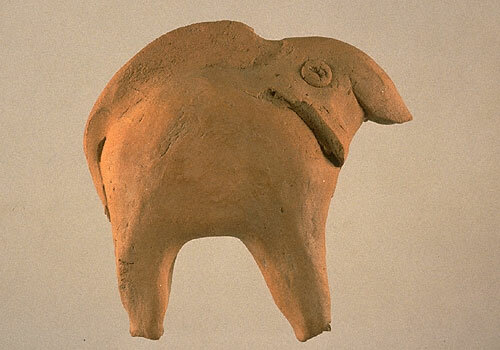 Although many animal figurines have identifiable traits (e. g., the applied "hide" and horn typical of a rhinoceros figurine), some figurines are not readily identifiable. 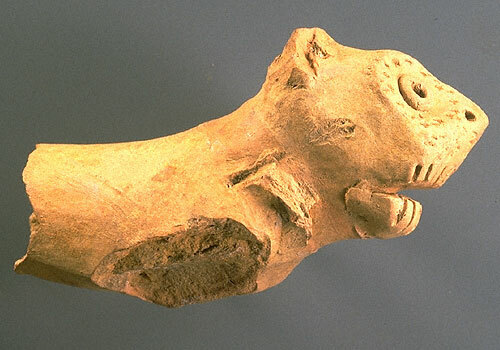 Animal figurines that are badly broken are sometimes particularly difficult to identify, but even the more complete figurines are not necessarily recognizable. 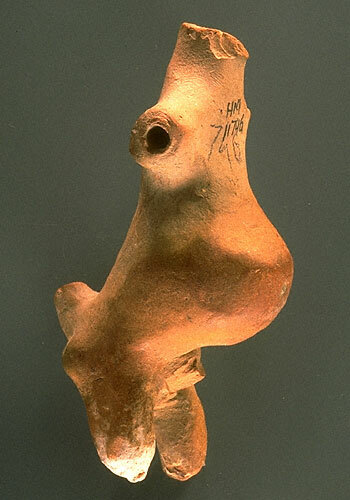 Perhaps the makers of Indus figurines created abstractions, possibly by emphasizing particular features (as is common in caricatures), that were and are not recognizable to others. Approximate dimensions (W x H(L) x D) 2.7 x 5.4 x 3.6 cm. Approximate dimensions (W x H(L) x D): 3.5 x 8.4 x 4.1 cm. Several types of birds are represented in figurines. 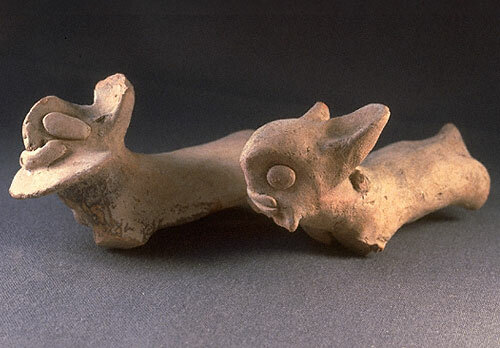 Bird figurines with long tapered tails probably represent parakeets. 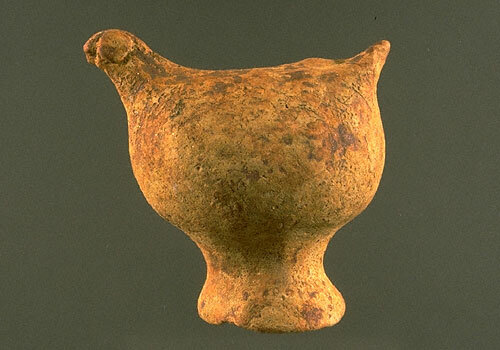 These birds often have flattened stylized feet that were attached to other terracotta objects such as cages of which there are at least two examples from Harappa. 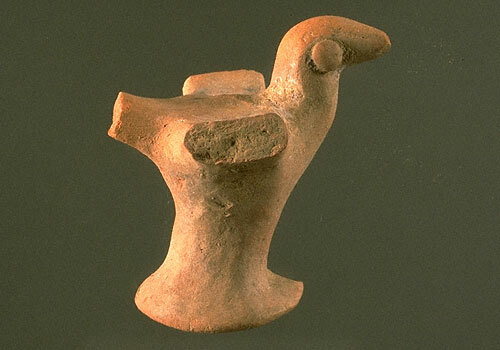 One of the male figurines from Harappa holds a bird, possibly a chicken or a duck, which also suggests that the Harappans kept birds as pets or perhaps as a food source. Approximate dimensions (W x H(L) x D) 2.0 x 5.0 x 2.5 cm. 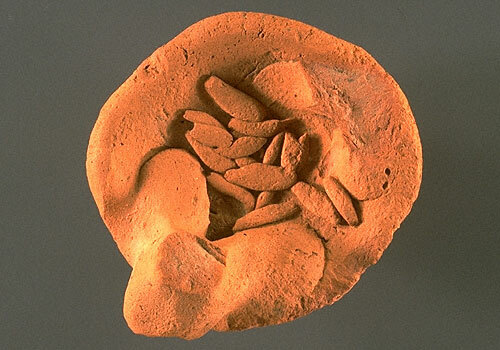 A circular terracotta platform or container with many small lozenges, possibly representing grain, between the flattened broken feet of two birds perched on opposite sides of the container provides another possible example of the keeping of birds by the ancient Harappans. Other bird figurines have no wings depicted at all and either stand on a circular base or on two legs that were inserted into the base of the body (only holes remain). Still others have no legs depicted at all. Among the most convincing cases for figurines as toys are the hollow bird figurines that have a hole either on the back near the tail or in front of the torso that allowed them to be used as whistles. 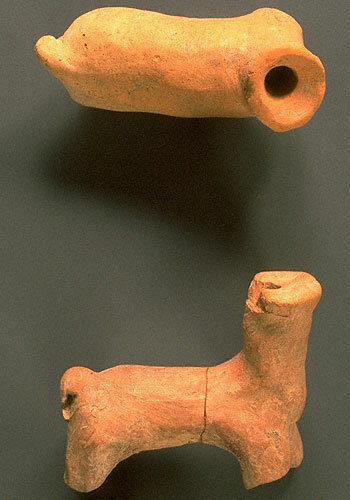 Similar terracotta "bird whistles" are still found in South Asia. Approximate dimensions (W x H(L) x D): 3.8 x 5.5 x 5.3 cm. 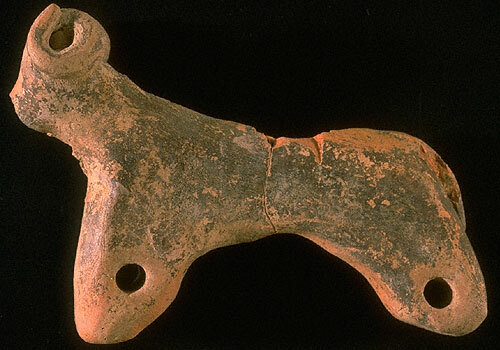 Another figurine that may have been used as a toy is the quadruped, probably a bovine, with a movable head and tail. It usually has pierced projections extending from the base of the neck to secure the (separate) head and neck laterally and a pierced projection above the shoulders (possibly a stylized hump) to secure and move the head vertically. It sometimes has a pierced projection on the rump as well, presumably for a movable tail. Approximate dimensions (W x H(L) x D): 4.0 x 8.0 x 6.0 cm. Approximate dimensions (W x H(L) x D): 4.0 x 4.0 x 2.5 cm. Approximate dimensions (W x H(L) x D): of the larger figurine: 3.1 x 6.0 x 5.37 cm. 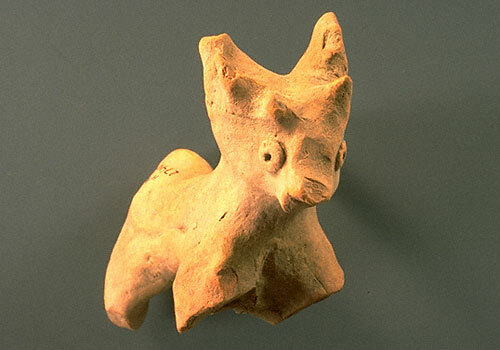 Cattle, water buffalo, sheep, dogs, elephants, rhinoceroses, monkeys, birds and many other animals are represented in the figurines of the Indus Civilization. Some of the animals depicted in figurines are familiar to us today, but others are no longer common or may have been mythical creatures, caricatures or representations of humorous characters in stories. The significance of these animals and the affection of people towards some of them are clear despite their relatively simple features. Some movable figurine heads are pierced in other places, such as through the horns on either side of the head. Approximate dimensions (W x H(L) x D): 7.2 x 9.4 x 3.0 cm. Whether or not the masks/amulets and attachable water buffalo horns were used in magic or other rituals, unusual and composite animals and anthropomorphic/animal beings were clearly a part of Indus ideology. The ubiquitous "unicorn" (most commonly found on seals, but also represented in figurines), composite animals and animals with multiple heads, and composite anthropomorphic/animal figurines such as the seated quadruped figurines with female faces, headdresses and tails offer tantalizing glimpses into a rich ideology, one that may have been steeped in mythology, magic, and/or ritual transformation. Approximate dimensions (W x H(L) x D): of the larger figurine: 3.5 x 7.1 x 4.8cm.